Just lift, place, and slide. The EZ Moves® furniture lifter gives you up to 10x your natural strength. Then the EZ Moves® slide right into place so your furniture simply glides across any surface. Then slide right out when you’re done. Clean in all those dark, hidden places, or rearrange rooms to design new spaces. The EZ Moves® lifter is great for adjusting and leveling appliances. The rubber tip protects your furniture and the ergonomic design saves your back. 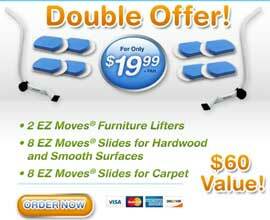 When ordering today you will receive 1 EZ Moves® Furniture Lifter, 4 EZ Moves® Slides for hardwood and smooth surfaces, and 4 EZ Moves® Slides for carpet for only $19.99 + $7.95 P&H, plus we will include a second set of EZ Moves® (1 EZ Moves® Furniture Lifter, 4 EZ Moves® Slides for hardwood and smooth surfaces, and 4 EZ Moves® Slides for carpet) FREE, just pay an additional $7.95 P&H.